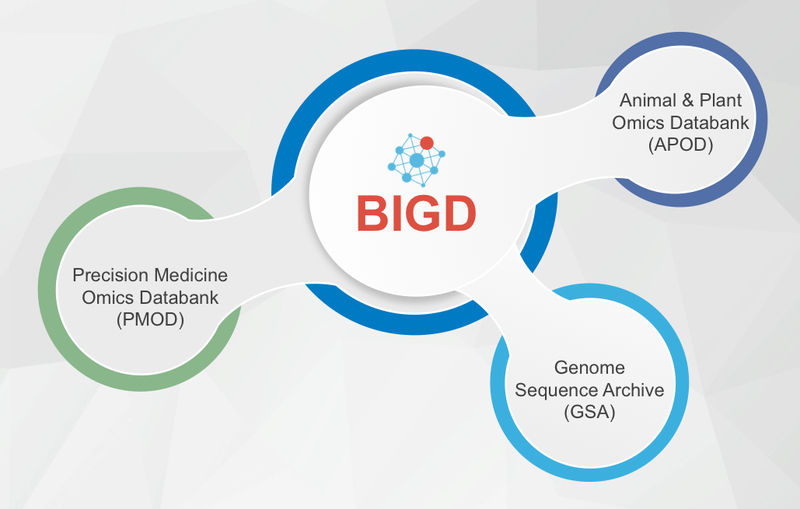 The following are major branches in BIGD, which are set up according to their different purposes and roles. Store raw sequencing data generated by a variety of high-throughout sequencers including 454, IonTorrent, HiSeq, PacBio, Nanopore and so on. Make raw data as well as metadata well-organized and publicly available to the scientific communities throughout the world. Develop advanced methods to ease big data submission and provide bioinformatics clouds for big data analysis and knowledge discovery. Integrate public personal omics data nationally and internationally and build precise reference genomes for different populations. Establish the research cohort of more than 1 million Chinese containing genome and health data over many years. Associate omics data with clinical data with the goal to develop more effective ways for precision health and medical treatment. Integrate a wide diversity of omics data for animals and plants, with particular focuses on economically important species in China. Create and maintain multiple omics database resources and provide open access to these resources for worldwide researchers. Perform fundamental data-driven research by linking omics data with agronomically important traits. In addition, BIGD has a branch of Information & System Management to provide technical and service support. Responsible for the administration of the network as well as the system infrastructure. Administer and maintain the database servers and provide robust and secure web system. Coordinate with other branches to ensure all resources at BIGD are always on and reliable.